The out-half has not won an international cap since 2012. An unexpected recall for the Lyon out-half. OUT-HALF LIONEL Beauxis will make his first start for France in six years when they face Scotland at Murrayfield on Sunday [KO 3pm, live on TV3]. With both sides losing their opening game of this year’s Six Nations, the fixture is a must-win and the in-form Lyon number 10 gets the nod following an injury suffered by Matthieu Jailbert last weekend and the continuing absence of Camille Lopez. 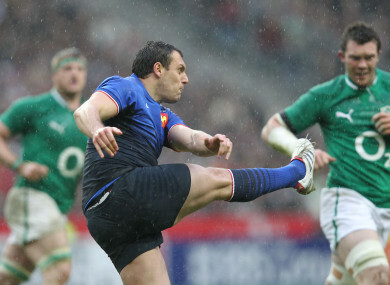 Beauxis last played for France against Wales in March 2012 and is one of three changes to the side which lost to Ireland in dramatic circumstances last weekend. Marco Tauleigne comes into the back-row for Kevin Gourdon, who suffered an ankle injury, while Henry Chavancy will not be risked at inside centre following a knock to the cheek; Geoffrey Doumayrou takes his place. Anthony Belleau keeps his place among the replacements as out-half cover but there are two new faces on the bench with Eddy Ben Arous and Louis Picamoles returning to the squad. Congrats to Luke Macken, who won tickets courtesy of Ulster Bank to see Ireland v Italy at tonight’s 42 Six Nations Show Live. We’ll be back before the Wales game - see you there. Email “Following a 6-year absence, Lionel Beauxis will start for France against Scotland”. Feedback on “Following a 6-year absence, Lionel Beauxis will start for France against Scotland”.